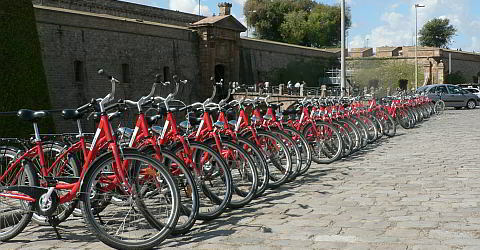 Explore Barcelona by bike: no matter if you would like to do a sightseeing tour of the districts or are planning a tour along the beach, a rented bike is an ideal vehicle, so explore the citty on your own. Closed on December 25/26 and on January 1/6. Bikes, locks and helmets are handed out at the rental station during business hours and have to be dropped off during business hours. A deposit is not necessary, however you have to lodge an ID for every booking. The bikes are rented in an flawless technical condition. The renter accepts the responsibility for all possible damages or loss of the bike during the rental time and is liable for damages or loss of the bike towards the hirer. In case of a loss of the classic bike the renter has to pay €200, for an e-bike €800, in case a loss of the lock €20 have to be payed. The hirer is not liable for personal damages or other damages that the renter might cause by using the rented equipment. It is the renters sole responsibility to follow the traffic laws and to protect himself / herself from possible damages that might occur by using the bike. The cancellation is free up to 48 hours prior the planned pick up. In case of a later cancellation a refund is not possible. It is possible to change the booking for free. Address of the pick up place: c/ Esparteria, 3, located only a few steps from the church Santa Maria del Mar. This is an ideal starting point for a bike tour and it is really easy to find. You will receive detailed directions with the booking confirmation. Please consider that you have to drop off the bikes during business hours. A refund for unused rental time is not possible. cancellation of the rental of e-bikes is free until two days before the scheduled pick-up, after which the full price is due. Would you like to rebook, so this is possible for free. By using a rental bike you are not just environmental friendly but are using one of the most flexible vehicles in a metropolis. The rental station is located in the Old Town district El Borne close to the church Santa Maria del Mar. Bicycling has become a real alternative in Barcelona. The cycle track network is well developed and you can get very fast almost everywhere. Or you just drive along the beach to the outskirts of Barcelona. You can follow the beach for miles on safe roads and then you can go swimming far from the hustle and bustle of the beach in Barcelona. Or you book one of our guided bike tours and learn many interesting things about Barcelona while you have fun on the bike. Please enter the number of bikes you want to rent.